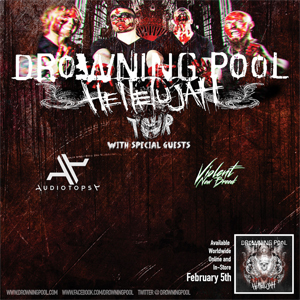 DROWNING POOL have announced a string of headlining tour dates serving as the first wave of support for their forthcoming LP. AUDIOTOPSY and VIOLENT NEW BREED will serve as support. "We're beyond excited to finally get out on the road in support of our new LP," says guitarist CJ Pierce. "We know DROWNING POOL fans are eager to hear new music live, they'll definitely get that and more at these live shows!" The band recently debuted a third new song titled "Hell To Pay". "It's about the futility of regret," says vocalist Jasen Moreno. "It's about the danger in second guessing yourself. It's about battling depression. It's about closure." The band released their hit single "By The Blood" last month and it continues to rise up the Active Rock Radio chart as well as SiriusXM's Octane channel. DROWNING POOL will also be performing at the 2016 NAIRMA AWARDS taking place January 22nd at The Yost Theater in Anaheim, CA. The award show is just one of many events surrounding the annual NAMM Convention. Click HERE for tickets and more info.